This is the round for the Soviet 25 x 218mm Naval AA gun (known as the 110-PM) adopted in 1953 and variations continued in production to 1984. The guns were installed as single or twin mounts, and were made for surface ships, and briefly as "wet mounts" for use on submarines. They were normally fed from 65 round belts. These guns were mounted primarily on destroyers, and various small vessels. The Chinese made version of this gun is known as the Type 61. Note that this is different from a Russian 25 x 218mm Rimmed round used with earlier guns (model 1940). 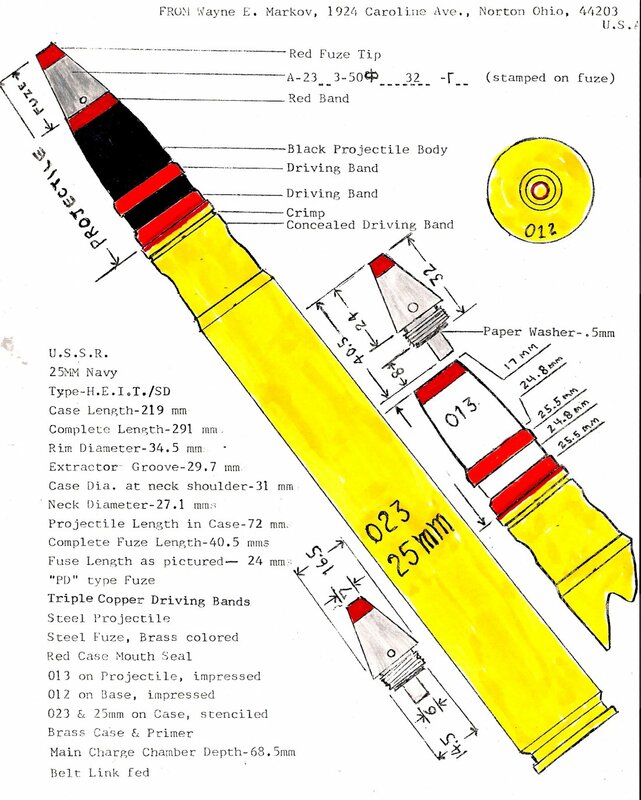 The photo shows this round at less than half size, and the actual diameter of the projectile is 25mm, or 1 inch, and overall length about 11 inches. This was sectioned from a LIVE round by the late Wayne Markov ( IAA member) of Norton, Ohio, for an ordnance specialist's desk piece, shown above complete with one of the links used for this caliber. This is extremely dangerous work and should not be attempted except by professionals. Also, possession of live high explosive ammunition is basically illegal for civilians. Mr. Markov was an expert, as well as a meticulous craftsman (and observer of safety precautions), who did all of his work by hand! It is absolutely complete including the special initiator bag at the base of the charge and the titanium dioxide anti flash coil between the internal spacers.